Blossom end rot can affect tomatoes, peppers, eggplant, cucumbers, squash and even watermelons. The most commonly affected tomato varieties include Roma, pear, certain beefsteak and certain salad types, according to University of California Cooperative Extension. What is blossom end rot? University of Missouri Extension explains that blossom end rot is an abiotic disease that occurs on the blossom end of fruits. It is caused by a calcium deficiency when fruits are forming, which can occur due to inadequate soil moisture or too much fertilizer. Plant roots need moisture to draw calcium up, so if soil moisture is too little, blossom end rot can occur, according to University of Tennessee Extension. Too much fertilizer can result in ammonium, potassium, sodium or magnesium building up and not allowing the roots to draw up enough calcium. Blossom end rot can allow for biotic diseases like fungi to enter fruit. What does blossom end rot look like? 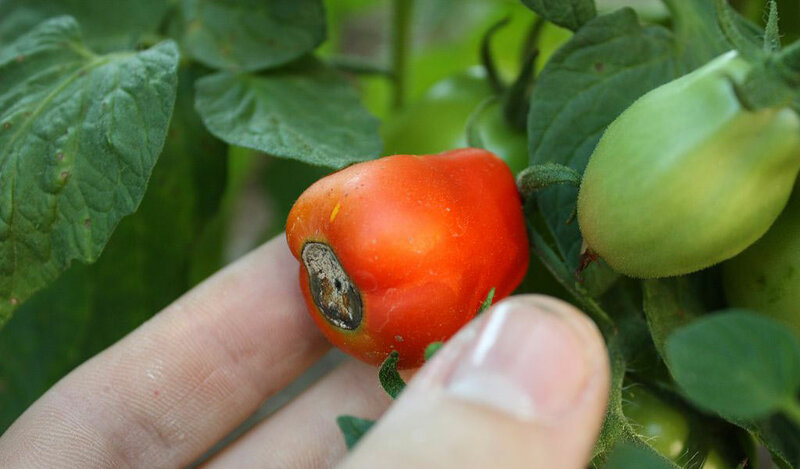 University of Tennessee Extension explains that at first, blossom end rot will appear as a light area on the blossom end of tomatoes. Over time, up to half of the fruit will become dark, sunken and leathery. On peppers, blossom end rot looks tan. University of Tennessee Extension says that blossom end rot on bell peppers happens on the tip of lobes. On pimento peppers, it will occur on the side near the tip. How do I stop blossom end rot? First, Clemson University Extension recommends having your soil tested. The results will indicate whether or not there is sufficient calcium in the soil. Sometimes there is enough calcium in the soil, but blossom end rot still occurs. Regardless, follow the soil amending recommendations from the test. Clemson also recommends avoiding over-watering until plants have begun to flower and produce fruit. Keep soil evenly moist while fruit is growing and apply mulch to maintain moisture and keep soil cool. Don’t use high-nitrogen fertilizer, don’t over-fertilize and don’t cultivate soil within a one-foot radius of the plant, so roots aren’t damaged. As soon as you notice blossom end rot symptoms, Clemson University Extension says to spray plants with calcium chloride or calcium nitrate. You can also remove fruits that show symptoms. University of California Cooperative Extension offers additional strategies for combating blossom end rot. University of Tennessee Extension says that blossom end rot typically only affects the first and second clusters of fruit, so succeeding fruit may not show any symptoms. Katie Woods grew up in Columbiana, Ohio. 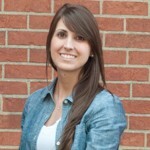 Katie likes reading, writing, enjoying the outdoors and DIY projects. TIP: save those old eggs shells; let them dry out in sun; when very dry, toss them into blender or smash them with a hammer into wee pieces. then, incorporate these crushed egg shells into the soil ’round about the roots of each plant. WOILA! calcium galore from the hen’s shells. He walked away in huff. P.S. amend those little egg shell bits below ground very well, lest the raccoons and other critters think there’s eggs lying about for a free meal. Thanks for reading, and thanks for the eggshell tip!